1LT trim. PRICE DROP FROM $41,995, PRICED TO MOVE $4,600 below NADA Retail!, EPA 29 MPG Hwy/17 MPG City! ONLY 15,955 Miles! 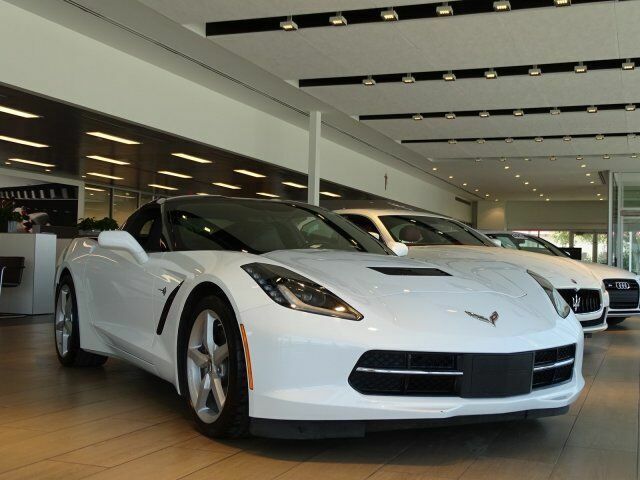 Leather, Premium Sound System, Aluminum Wheels, Back-Up Camera, TRANSMISSION, 7-SPEED MANUAL. CLICK NOW! ROOF PANEL, 1-PIECE TRANSPARENT, REMOVABLE, ENGINE, 6.2L (376 CI) V8 DI (455 hp [339.3 kW] @ 6000 rpm, 460 lb-ft of torque [621.0 N-m] @ 4600 rpm) (STD), TRANSMISSION, 7-SPEED MANUAL with Active Rev Matching (STD), REAR AXLE, 3.42 RATIO, LIMITED SLIP, CHEVROLET MYLINK AUDIO SYSTEM 8" diagonal color touch-screen, AM/FM stereo with seek-and-scan and digital clock, includes Bluetooth streaming audio for music and select phones; Pandora, TuneIn radio, Stitcher and Siri Eyes Free for compatible smartphones (STD). Onboard Communications System, Aluminum Wheels, Keyless Entry, Remote Trunk Release, Steering Wheel Controls, Heated Mirrors, Electronic Stability Control. Was $41,995. This Corvette is priced $4,600 below NADA Retail.